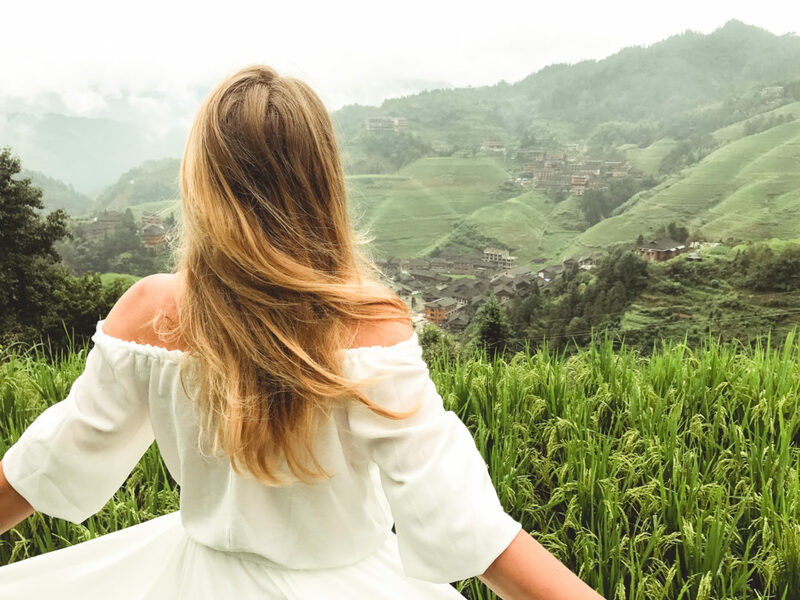 A few hours by bus from Guilin, you’ll find one of the most amazing areas in all of China – the Longji Rice Terraces, aka “Dragon’s Backbone”. 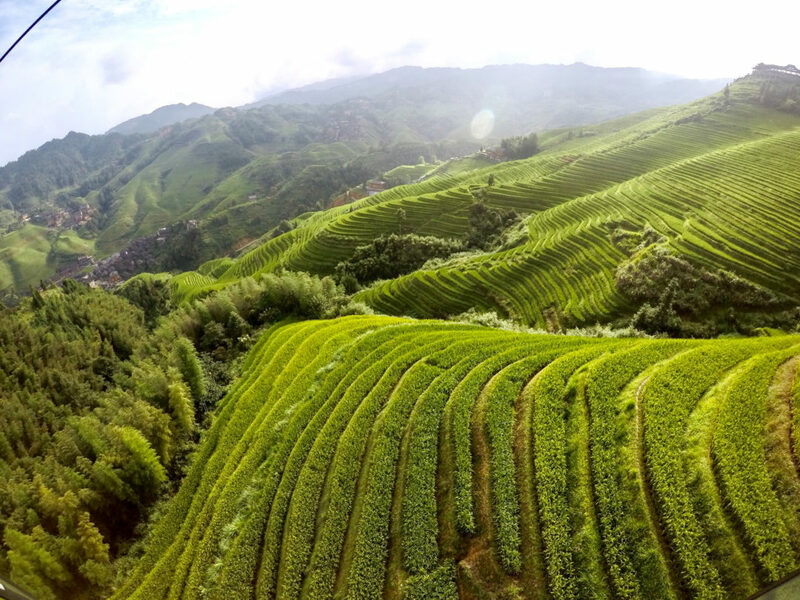 The name comes of the resemblance of the layered rice paddies to a dragon’s scales. These magnificent terraces are a man made construction and it began way back in the Yuan Dynasty. 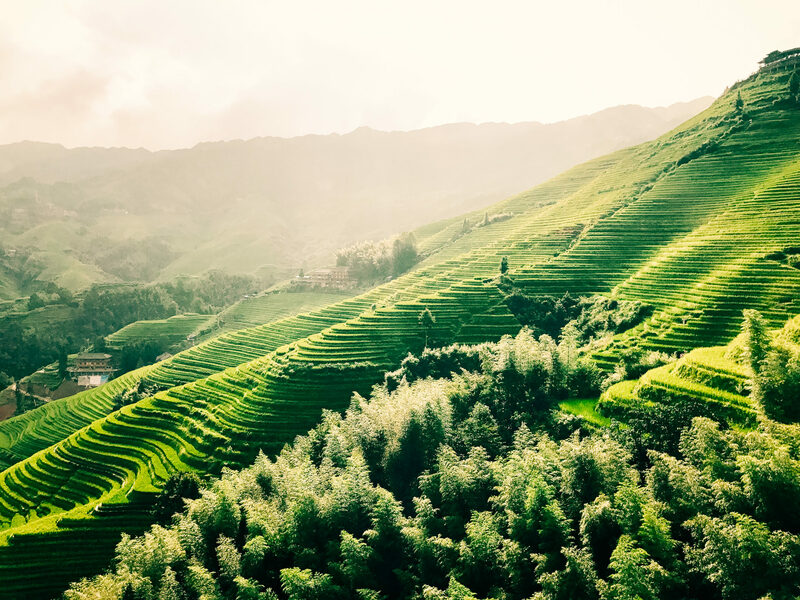 It’s a stunning example of human landscape engineering, and perhaps the most beautiful example of terraced rice fields in China. It is a scene of such splendid and breathtaking beauty it has to be seen to be believed. 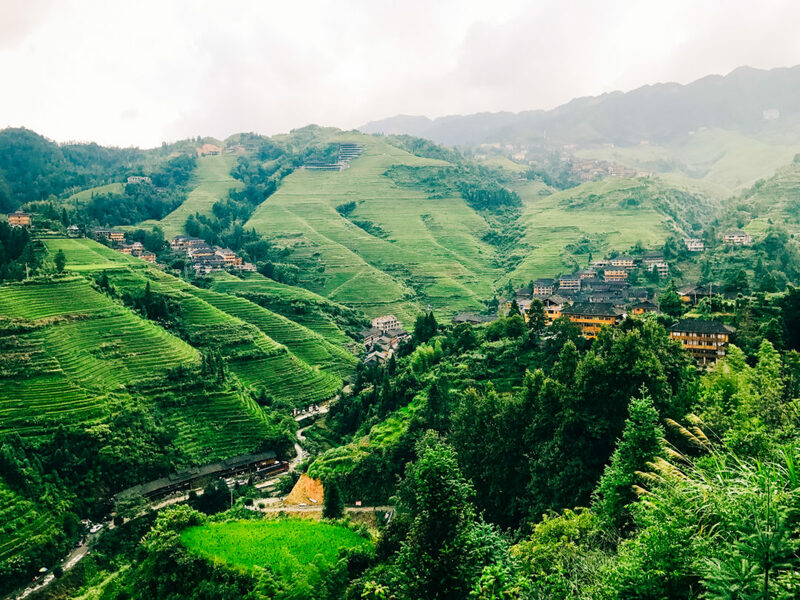 The Longji Rice Terraces refers to several village areas in Longji County. 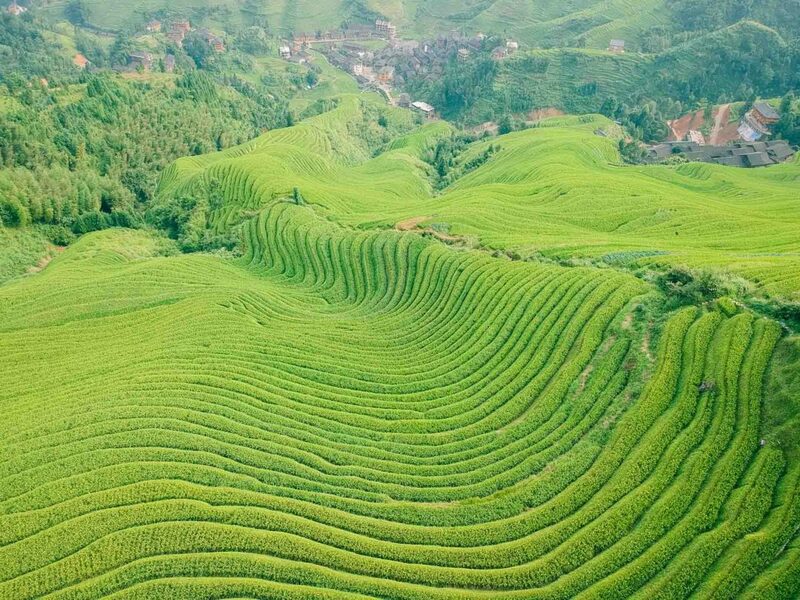 The most popular terraced field areas are around Ping’an Village, where Zhuang minority people live, and in the Jinkeng area, home to the Red Yao. Ping’an Zhuang Village Terraced Fields are the earliest and most developed terraced fields in Longji. These terraced fields are around Ping’an Village and two other smaller villages, inhabited by the Zhuang minority. The villagers live in traditional wooden three-story houses. The area is well-equipped with modern facilities, where dining, accommodation and transportation are very convenient with over 80 hostels and hotels available. Jinkeng Red Yao Terraced Fields are farther than the Ping’an Terraced Fields from the tourist entrance. The Jinkeng Terraces hold several Yao villages. You can enjoy different sceneries in different months. Spring and autumn are the most popular times to take photos and go hiking. From April to June the fields are well-watered and you can see water glittering in the sun in spring. From July to September it is the growing period for the grain seedlings. You will see green and vigor everywhere. From September to October, the rice on the fields is ripe. You will see layers of golden yellow. Farmers can be seen harvesting in the fields from around October 1st to 15th. From October to April you will see nothing more than the plain scenery of brown empty fields (and maybe snow). 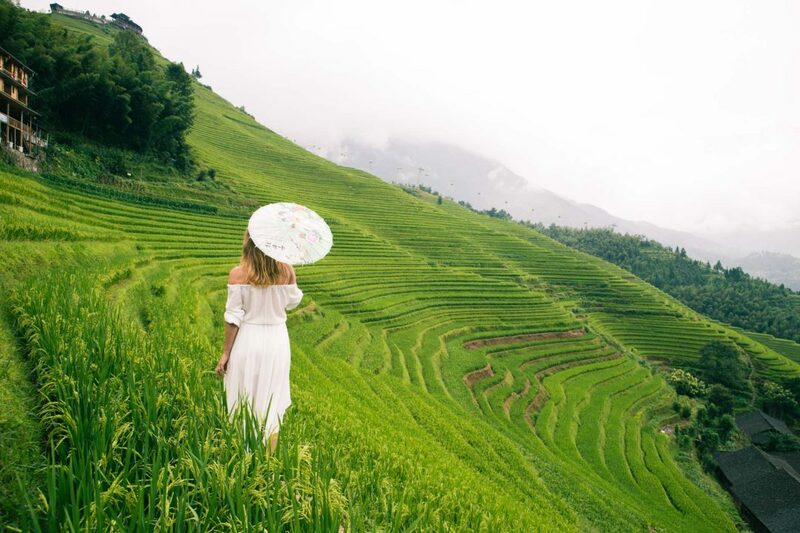 The Longji Rice Terraces are about 100km North of Guilin City, and it takes about 2.5 hours to drive there. 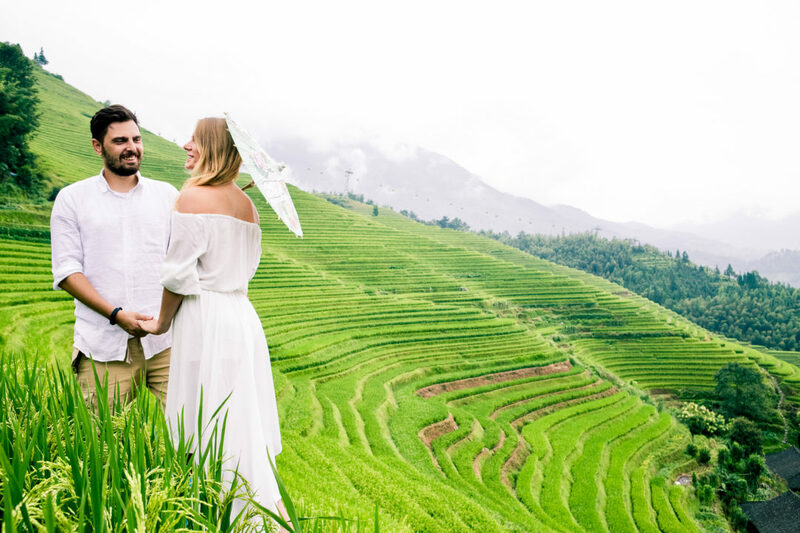 You have a couple of options to get out to the rice terraces, such as taking part in a day tour from Guilin (which we did), organising a private car or taxi or taking a couple of public buses. Head to the Qin Lan Bus Station and board a bus headed to Longsheng Town. Buses leave every 15 minutes, the journey will take two hours. There will be plenty of minivan drivers offering to take you there to. Depending on your negotiating skills, you may be able to go with one of them. 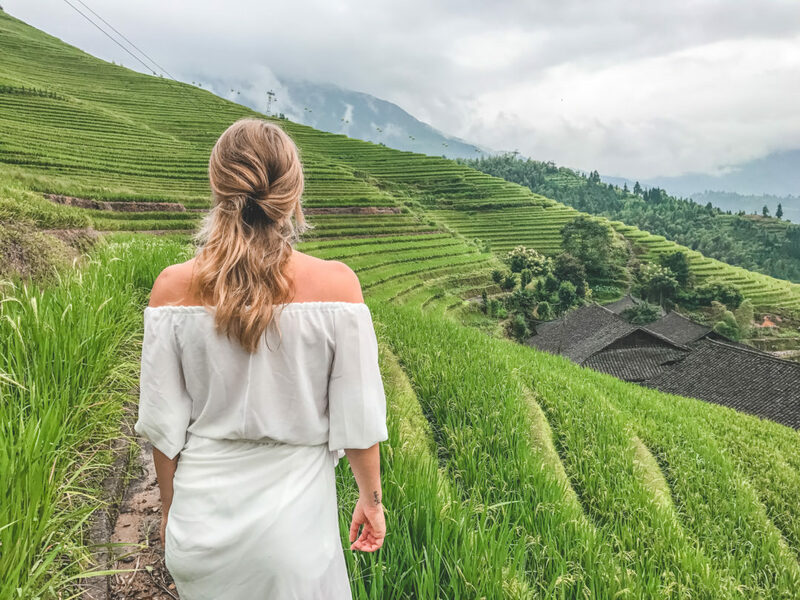 Once you get to Longsheng Town you need to swap to another local bus to the Longji Rice Terraces, which will take another hour. The buses will take you to different villages, so know which one you want to go to before jumping on a bus. Tip- it is very difficult cu use the public bus system in China and time consuming. No one speaks English and can help you when in need. 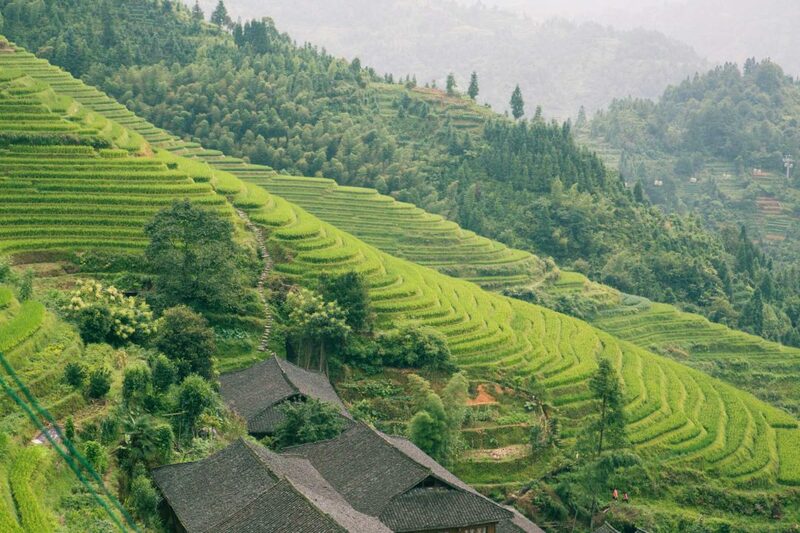 It is easy to organise a private shuttle bus from Guilin City to Lonji Rice Terraces and the cost is not that high. 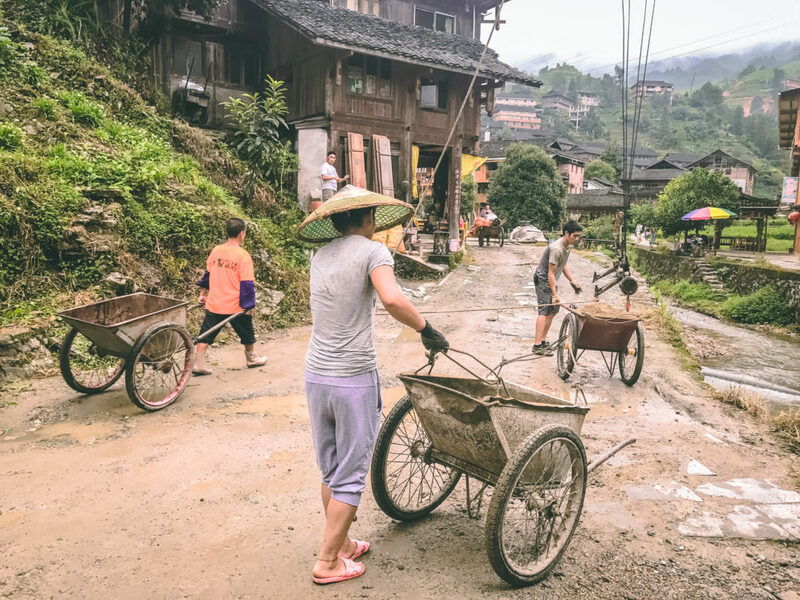 We were a group of 10 and we took 2 trips: Longji Terrace and Li River Crouse, all for 60 Euros/Pers. West Hill Music is the highest point on the terraces (altitude 1,180 m) with the broadest panorama. Popular for sunrises and sunsets, it takes two hours to walk there. 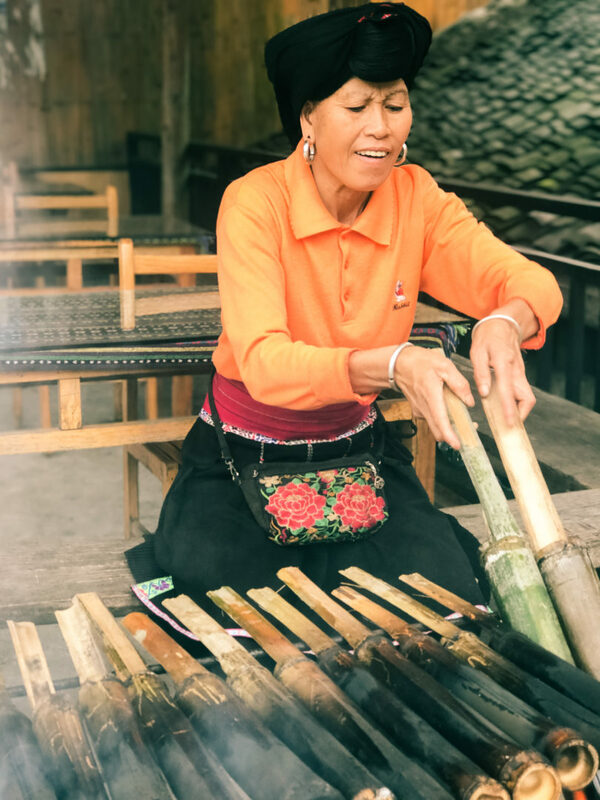 More than 90% of published Longji Terrace photos are taken there. The ‘Large-Scale Thousand-Layer Terraces’ is relatively low and easy to climb to as the paths are good. The terraces are fantastic and you can see the Yao people’s houses. It is an excellent place to see a sunrise. Golden Buddha Peak’. This is the best place to take sunset photos. 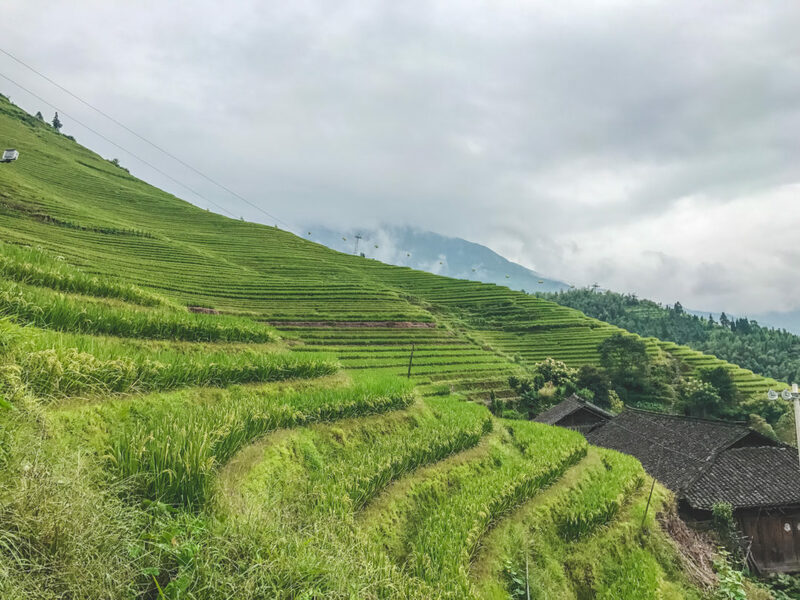 The cable way from the bottom of the rice terraces to the peak is very convenient for those who are not good at walking (20 minutes instead of 3 hours of walking). These are the three panorama points that we didn’t miss. Once there you have two options – take the cable car or hike. Chinese tourists aren’t exactly into the idea of hiking up a mountain, and the area would see far less domestic visitors without the lazy way up. The hike up is relatively easy, leading you through a few villages where you can buy snacks and drinks. There’s not much to this mountainside village, but that’s the point. Slow down, relax, and enjoy the peace and quiet of rural China. There are a few viewpoints scattered around the village, which you can reach in easy 15-20 minute walks. We hiked up to the three viewpoints which are the best ones in the area. 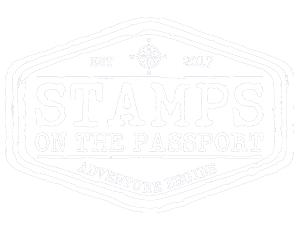 The souvenir shops here are filled with local artisanal crafts and are fun to potter around. 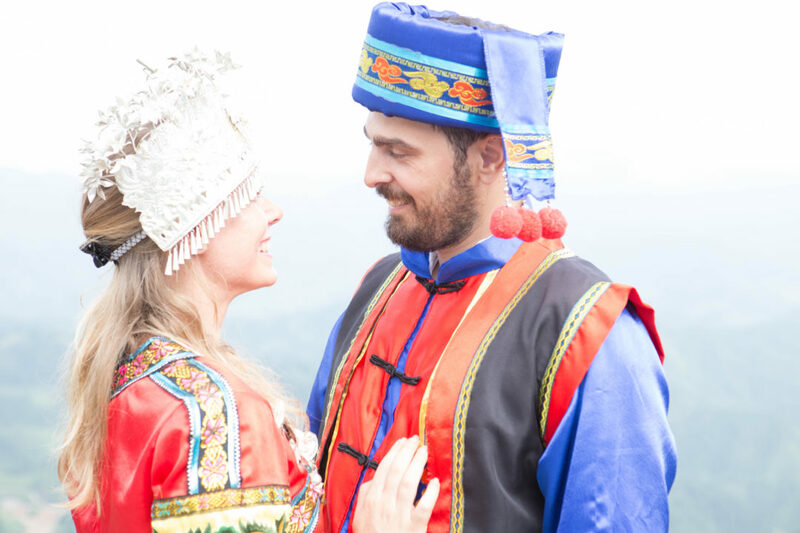 There is even the opportunity to dress up in ethnic clothing to pose for photos and we didn’t miss it. We had to much fun. The Longji Rice Terraces were absolutely stunning. They truly are the most impressive we’ve ever seen and I’m pretty sure nothing can top that any time soon. 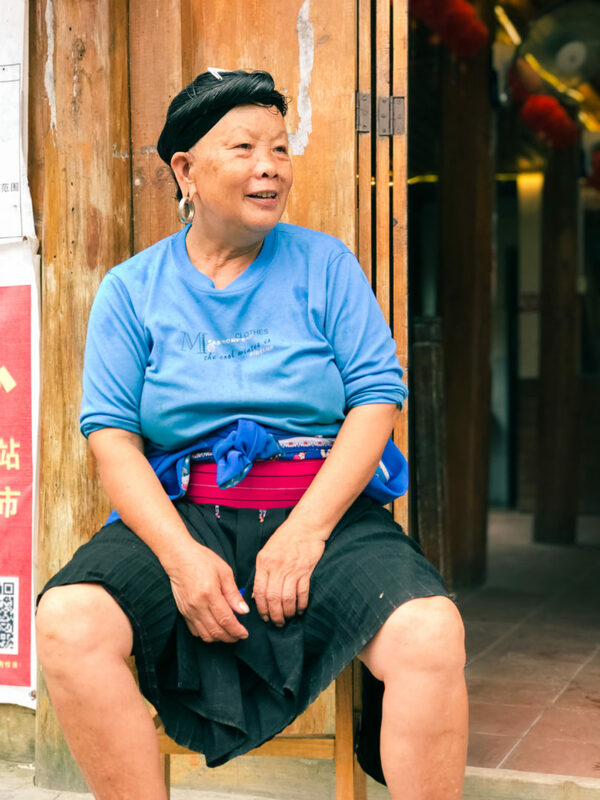 Longji is also home to two of China’s ethnic minorities – the Zhuang and the Yao. 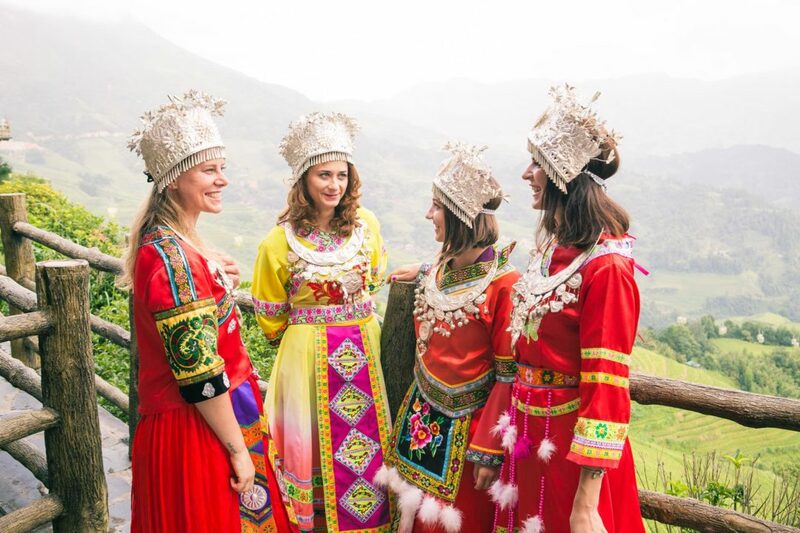 The Yao women were the biggest hit. They are most famous for their long hair, which they only cut once during their lives – when they are 18 years old and ready for marriage. One of the women in the village even holds the Guinness World Record for the longest hair. 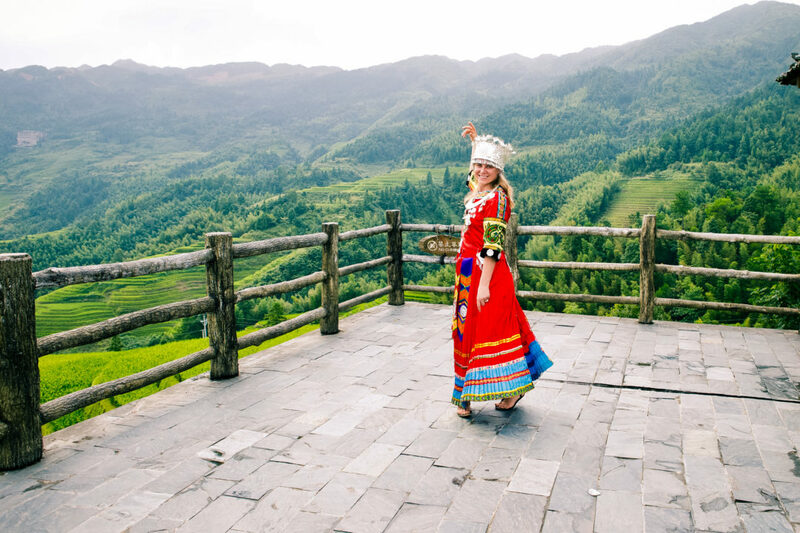 Huangluo Red Yao Village It is known as the ‘World’s Top Long Hair Village’. It is a tradition for girls to wear long hair and over 60 girls have over one-meter long black hair. You can tell a woman’s marriage status from her hair. An unmarried woman should pack all of her hair in a cloth. You are not able to see her hair. A married woman will also pack her hair, but will leave a bun outside. The ‘long-hair show’, ‘red-stick dancing’, and ‘umbrella dancing’ are performed in the village. It is very touristy. If you are looking for something less staged, skip it. Thanks for this post. It appears that you did a day trip from Guilin. And, yet you managed to cover so much!! I am really struggling with my planning. I can spend one night in the village. 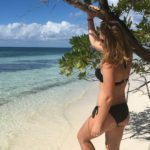 Can you suggest which village I should stay in? We had our accommodation in Guilin and from there we took a day trip to Longji Rice Terraces, from a travel agency. We left Guilin very early in the morning and while there the driver waited for us in the parking place. In the evening we went back to Guilin. 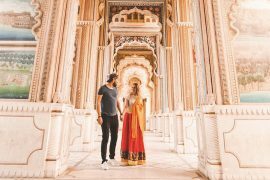 There are many travel agencies offering this tour. 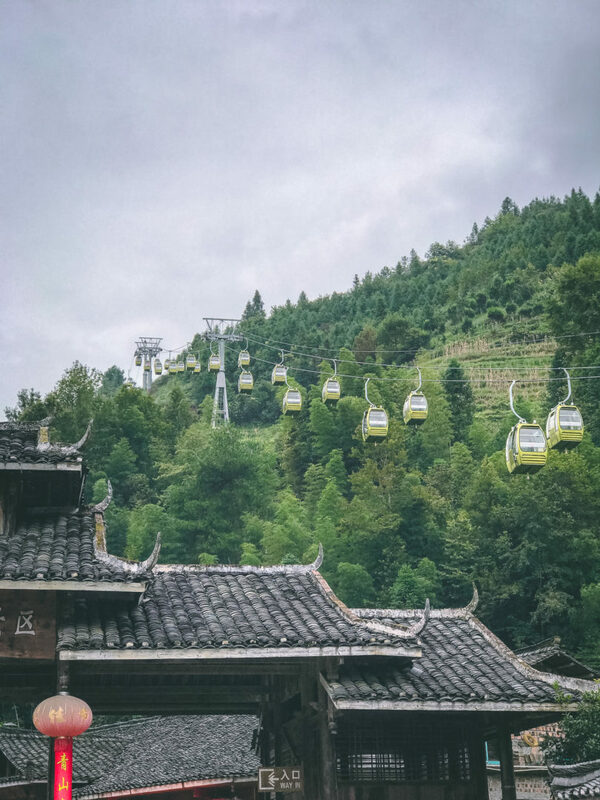 You can reach Longji also by yourself, but it will be more difficult because you will have to change some buses.